Monovision is a unique method of restoring near vision when people experience visual problems reading after the age of 40 due to loss of lenticular accommodation. This condition is called presbyopia. 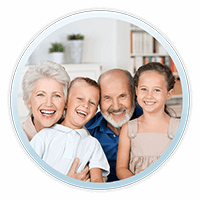 Presbyopia occurs as part of the natural aging process. The eye’s crystalline lens loses its ability to bring close objects into clear focus. In monovision, the nondominant eye is usually corrected for near vision, and the dominant eye for distance. Thus, the patient uses one eye to read, and the other eye to see at distance. Generally, the reading eye is usually left with 1.5 to 2.0 diopters (see glossary) of residual nearsightedness while the eye to be used for distance is left “plano” ( no refractive error). Monovision used to involve wearing one contact for close vision and the other contact for far vision. Not all patients like monovision because it requires some adaptation and training of your eyes, however; most patients are able to make this adjustment. Patients that suffer from presbyopia often use bi-focal glasses as a treatment option. Bifocal contact lenses are now available. 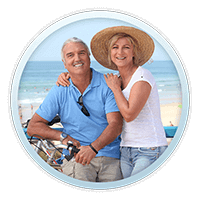 Monovision LASIK can also be an option. Monovision can be created permanently with LASIK once the contact lens trial is completed and the patient is found to adapt well to it. for the trial comfortable soft contact lenses are put in your eyes by our doctor. These lenses do not hurt, or irritate, and are well tolerated during the trial period. If you are a patient considering monovision LASIK you should first wear monovision contact lenses several days to determine if you can make this adjustment. Please consult Dr. Ellis directly regarding this procedure. 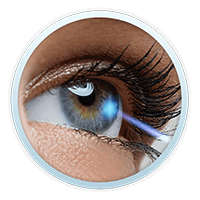 Monovision LASIK is a permanent surgical procedure. 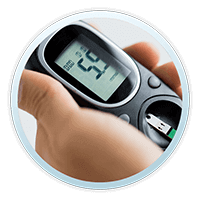 This test is quite comfortable with the newer soft contact lenses. The newer lenses are usually placed in the eye by Dr. Ellis at the time of the initial consultation for Monovision LASIK. The NearVision CK® System has been approved by the FDA for improvement of near vision in the non-dominant eye of presbyopic hyperopes and presbyopic emmetropes. 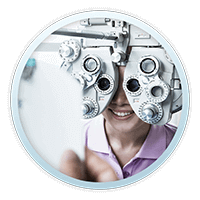 A test called the loose lens test is used to qualify the appropriateness of this procedure to meet your visual needs. CK is thought to produce a bi-focal effect in the cornea allowing better near vision in one eye without a large decrease in distance vision in that eye that sometimes occurs in monovision LASIK. In contrast to monovision LASIK, where inducing myopia in one eye for reading causes a large decrease in distance vision in the monovision eye, CK may give improved near vision without a large decrease in distance vision. 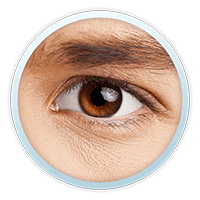 The CK procedure is usually performed in the non-dominant eye which is to be used for reading. The procedure usually enables reading of moderate size print, however for lengthy reading of small sized print such as telephone directory pages or contracts the use of reading glasses may be preferable.